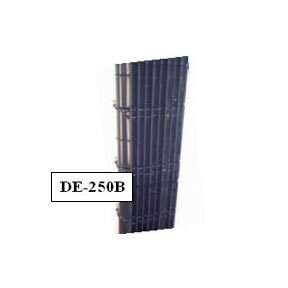 If you’re searching for “Drift Eliminators” , “Cooling Tower Drift Eliminators” or “Heavy Duty Drift Eliminators“, while looking for cooling tower drift eliminator suppliers, Cooling Tower Products Can Help! 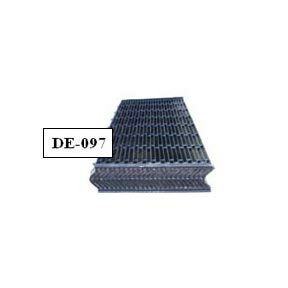 We sell PVC, Cellular and other types of cooling tower drift eliminators. Our drift eliminators are designed to outlast O.E.M. and other aftermarket Dura Drift Eliminators for Evapco, Marley, and BAC cooling towers. Have questions? Give us a call today at (602) 268-1584. The heavy duty drift eliminators that we offer come designed to outlast aftermarket and O.E.M. drift eliminators. We have a full supply of our heavy duty drift eliminator blades in house ready to build to your towers specs. Our lead time is low and most orders are going out in 1-2 weeks. 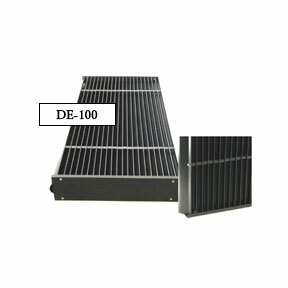 Our DE-100MAX eliminators can be used on all manufactured cooling towers, and condensers. We use stainless steel hardware and extruded PVC blades which makes our DE-100s rigid, hail resistant, snow loading, can be walked on, and able to be removed for pressure washing maintenance and returned to service. I have attached a cutsheet above of the DE-100MAX. Drift eliminators are designed to control the loss of drift (water, chemicals, minerals) droplets that evaporate into the atmosphere in a cooling tower by capturing and preventing the harmful droplets from exiting the cooling tower and into the environment. Drift eliminators perform their function by causing droplets to switch direction and lose their velocity once they hit the blade walls causing the droplets to fall back into the cooling tower. 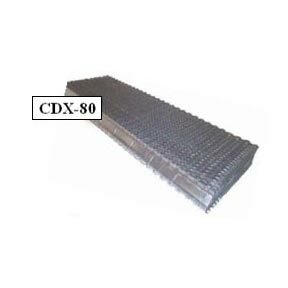 The most efficient cooling tower drift eliminators will keep your loss of drift to lower than a .005% drift rate. 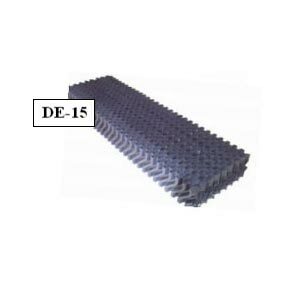 Cellular cooling tower drift eliminators supply the most effect amount of surface area for maximum efficiency and removal of drift. The cellular design of this eliminator allows for better flexibility when installing and trimming parts for the perfect fit. A factor that is very important concerning drift emissions of cooling towers. Blade cooling tower drift eliminators allow for rugged durability and a long life span because of their heavy gauge blades. These eliminators are designed to be cost effective while providing adequate droplet capture to keep your process water in your cooling tower. Maintainable Efficiency & Longer Service Life. Also check out our Cooing Tower Drift Eliminators. All cooling towers lose water due to evaporation. With a drift eliminator a cooling tower’s evaporation is just water vapor and isn’t harmful to the environment. Drift in cooling towers is the unwanted loss of water from the system. A drift eliminator stops airborne water droplets from leaving the cooling tower and helps preserve water. The water in cooling towers carries chemicals and minerals which help prevent bacteria from growing. Containing these chemicals helps preserve the environment around your property. A drift eliminator forces the airborne water droplets to change direction and land on the blades. From here the water drips back into the system. Eliminator Blade – Extruded High Impact P.V.C. Blade Spacer – Extruded High Impact P.V.C. End Cap – Extruded High Impact P.V.C.